Today, besides being Memorial Day, is the commemoration of two of my favorite saints: St. Bede the Venerable and Pope St. Gregory VII. St. Gregory VII is especially pertinent in today's world, as the secular and ecclesiastical powers in our country are once again coming to odds. The drama of the Investiture Controversy and its immortal climax in the snowy grounds outside Canossa are well documented; Norman F. Cantor wrote a great work on the Investiture Controversy in England that I read when doing my senior thesis on Kingship. Although today's counterparts to Henry IV are unlikely to repent at the censure of popeor bishop, the issues of the Controversy remain ever valid: shall the Church govern itself as it sees fit or shall it bow to the pressures of the world and of worldly politics? Often ignored is the role that the triumph of the papacy over the Holy Roman Emperor played in the blossoming of what has been called the renaissance of the 12th century. Following the Concordat of Worms in 1122, the Church entered into a cultural and theological flowering that endured into the late 13th century. While I don't deny the role of the rediscovery of the texts of Aristotle in this movement, I think the freedom of the Church that was ushered in after the Investiture Controversy must have been a large factor in bringing about the atmosphere of ecclesiastical liberty and intellectual curiosity that led to this renaissance. Then there is St. Bede the Venerable. For a long time I went back and forth as to when the "Golden Age" of the Church was. For a long time I was convinced, like Dr. Warren Carrol, that the height of Catholic civilization was the 13th century. Later, I began to change my mind and believed that the Church was most pristine in the century following the Catholic Reformation. Of course, there are good arguments for the 4th century post-Nicaea period as well due to the great multitude of eminent saints and doctors all living at the same period and discoursing together. I later pegged the so-called "Dark Ages" as the best time in the Church's history, from around 400 to 700, because the Church's monastic tradition was strong and pure, its evangelical fervor at its greatest and it had not yet been plagued by the philosophical sophistry and subtle theological divisions that began to pester it in the Scholastic period and beyond. 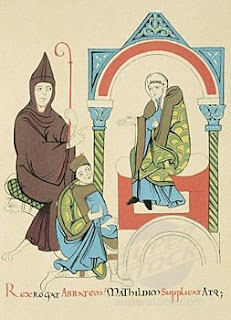 There is a certain charming simplicity to the period of St. Bede and the Anglo-Saxon saints, a simplicity I have tried to reawaken in my posts on "Obscure Anglo-Saxon Saints." If I had to choose a favorite time in Church history, I'd have to pick the middle to latter part of the first millennium, the age of Benedict and Bede, Augustine of Canterbury and Anskar of the Norse, the age of obscure saints with names like Wilifrid, Willibrord and Oswin and even obscurer kings with names like Rollo, Ecgfrith and Offa, the age that was ushered in by Clovis and ushered out by Charlemagne and the establishment of the Holy Roman Empire. This is definitely my favorite time in Church history, and we would do well to emulate some of the spirit of that time. But I have also come to realize that "Golden Ages" do not exist. Even in the 13th century, the alleged Golden Age, it is fascinating to read the writings of saintly men, contemporaries of Aquinas, who were sure the end times were upon them. Things were so bad, they reasoned, that the end of the world was surely upon them. The fact that even men of the 13th century though things were so awful that Armageddon was around the corner suggests that, while certain ages do have elements objectively better or worse than other ages, the designation of a Golden Age to any one period is somewhat utopian and unrealistic. But I think the Church does indeed have a certain Golden Age, and this is what I have realized by studying its history and the lives of the saints. The Church's Golden Age occurs wherever a saintly man or woman fulfills Christ's commands in an exemplary way. So when is the Golden Age? Go to Auschwitz in Poland and witness the self-sacrifice of St. Maximilian Kolbe, and there is the Golden Age of the Church - or likewise, go back in time to the square of Assisi and watch St. Francis return his clothes and name to his father in pursuit of Holy Poverty, and again you are in the Golden Age. The grilling of Lawrence, beheading of Thomas More, the lonely martyrdom of St. Isaac Jogues and St. Jean Brebeuf among the savages of North America, all are instances of a "Golden Age" bursting upon us; or more humbler examples: the persistence of those praying outside abortion clinics, the humble peasant of yesteryear giving thanks to God for the fruit of the earth and the rains that bring it forth, or the quiet enlightening of the mind that happens as one reads G.K. Chesterton or C.S. Lewis for the first time, when they put the book down on their lap, gaze out the window and ponder realities they had never thought of before. All of these moments are the Golden Age of the Church. So, reflect on these things as you enjoy your Memorial Day, and give thanks to God for the many blessings enjoyed in your life, unworthy though you be to receive them.